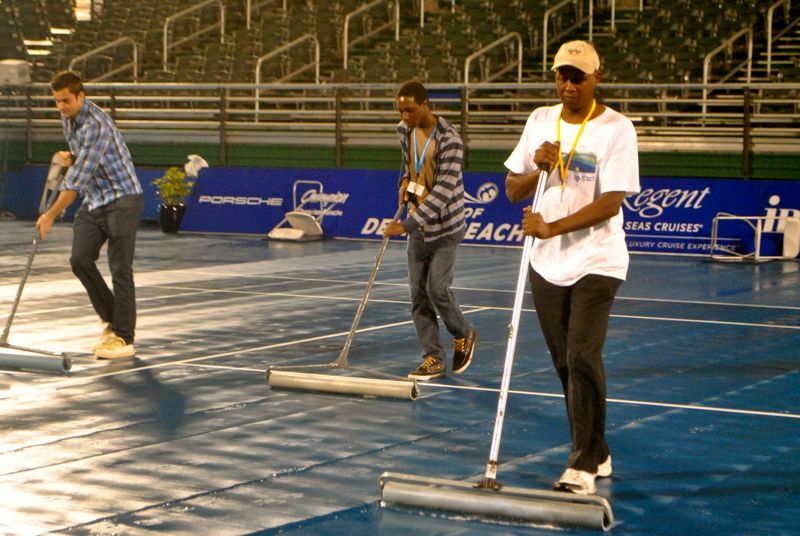 A crew tries to dry the stadium court Wednesday evening at the Delray Beach International Tennis Championships. A nearly continuous drizzle prevented play play from starting, however. 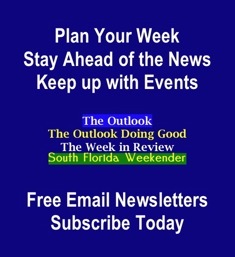 DELRAY BEACH — Rain, rain go away. Please. Come back another day. Say, the middle of next week, maybe. A near all-day rain wiped out most of Wednesday’s schedule at the Delray Beach International Tennis Championships, forcing tournament officials to shuffle Thursday schedule. Crews attempted to dry the court Wednesday evening but a nearly continuous drizzle made the effort futile. Xavier Malisse of Belgium, the tournament’s eighth seed, and Daniel Munoz-De La Nava of Spain did manage to start their match but were tied at 2 in the first set when the rains came. They will resume play at 11 a.m. In the only match of the day played to completion, Jaroslav Levinsky of the Czech Republic and Yen-Hsun Lu of Taiwan defeated James Cerretani of the United States and Edouard Roger-Vasselin of France 6-4, 7-5 in the double portion of the ITC. Ticket holders from Wednesday’s day session may buy comparable tickets for any session Thursday or Friday at a 50 percent discount. Those who had tickets for Wednesday evening’s session may exchange their tickets for comparable seats for any session Thursday or Friday. Both offers are based on availability. — 11 a.m. Xavier Malisse vs Daniel Munoz-De La Nava resumes in progress with the score 2-2 in the 1st set. — Not Before 12:30 pm: Denis Istomin vs Tommy Haas. — Not Before 2:30 pm: Ernests Gulbis vs Sam Querrey. — 6:30 pm: Yen-Hsun Lu vs 6th seed Kevin Anderson. — Not Before 8:30 pm: John Isner vs Go Soeda. — 11 a.m. Ivo Karlovic vs Edouard Roger-Vasselin. Jack Sock vs Ricardas Berankis. — Not Before 2:30 p.m.: Ivan Dodig vs Evgeny Donskoy. —11 a.m. Johan Brunstrom and Raven Klaasen vs Tomasz Bednarek and Marinko Matosevic.